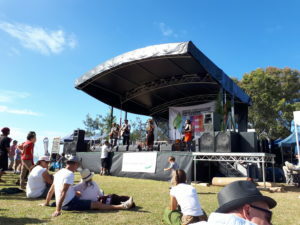 On Sunday, I attended the World Environment Day (WED) celebrations at Cotton Tree Park on the Sunshine Coast with all the other happy and laughing people who care about the environment. What a beautiful sunny day it was by the Maroochy River to be entertained and learn more about the amazing community groups and government agencies working for our natural environment. The environment movement is often accused of not focussing on solutions to our significant environmental challenges. The challenges like climate change, dependence on fossil fuels, jobs in transitioning to renewables, pollution from plastics and the built environment continually replacing the natural environment were highlighted by the stall holders. From solutions like tiny houses, solar energy and recycling there were many ideas providing a solutions focus by the environment community. While we all appreciate the attendees at WED celebrations are largely the converted the participation of families with young children who are already quite aware of the challenges is reaffirming of the efforts of many people to raise the awareness in the community. The challenge is therefore to take the positive energy of WED to continue to communicate the messages through a range of media. We need to use more opportunities like community radio Noosa 103.5 FM and our local community papers like the Coolum and North Shore Advertiser to get the message out to the wider community. We clearly will still need to use the social media like Facebook and other print and electronic media but don’t forget the value of simple conversations as we build relationships for the future. The message needs to be clear to ensure that the social, cultural, economic and environmental issues are all considered when it comes to projects like an Airport Expansion or the development of flood prone land at Twin Waters West. There have been failures to effectively communicate and engage the entire community on issues that will impact their children’s future and the WED energy gives us all hope. The future is bright with the WED energy taking us forward as a community.